Red and Bold Red italics in this bulletin indicate changes made to the RoofStar Guarantee Standards wording. 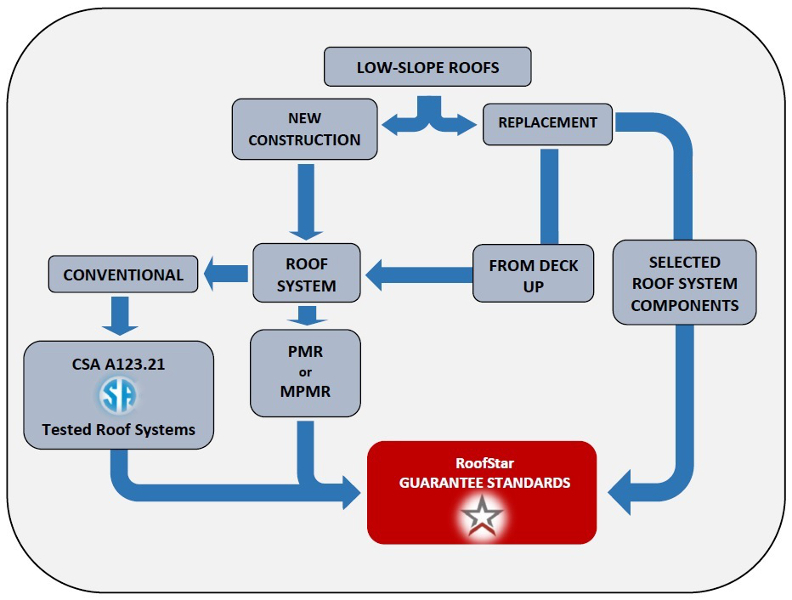 Refer to the published RoofStar Guarantee Program Standards. Because membrane roofs can be applied on slopes greater than 2:12, and ASM (as one example) can be applied to slopes as low as 0 (think ‘barrel roofs’ at their apex), the use of the terms “Low-slope membrane roofing” and “Steep-slope roofing” have not adequately served the Guarantee Program. 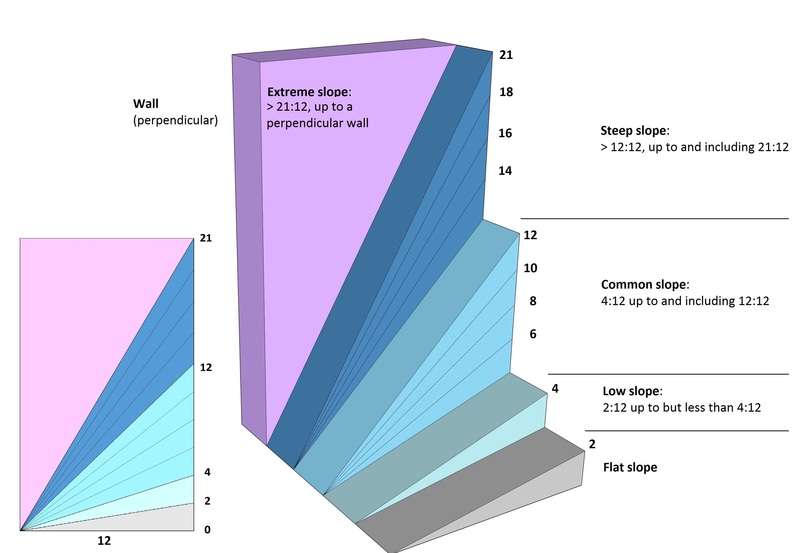 Furthermore, the distinction of roof types based on slope has become perplexing to some users of the RPM, as for example when discussing the application of shingles on ‘low-slopes’ while simultaneously describing shingles as a ‘steep-slope’ material. Flat Slope means a roof with a slope less than 1:6 (2” in 12”, or 9 degrees). Low Slope means a roof with a slope from 1:6 (2” in 12”, or 9 degrees) up to but less than 1:3 (4” in 12”, or 18 degrees). Common Slope means a roof with a slope 1:3 (4” in 12”, or 18 degrees) up to and including 1:1 (12” in 12”, or 45 degrees). Steep Slope means a roof with a slope greater than 1:1 (12” in 12”, or 45 degrees) up to and including 21:12 (21” in 12”, or 84 degrees). Extreme Slope means a roof with a slope greater than 21:12 (21” in 12”, or 84 degrees). The diagram below illustrates these slope definitions and has been incorporated into the RPM (for now only in the RoofStar Guarantee Standards for SBS-modified Bitumen Membrane Roof Assemblies; other Parts, i.e. single-ply membranes and all water-shedding systems will be updated over time). Parts 10 and 11 (with respect to fasteners). Wind uplift design requirements have been substantially revised (now adopted by the 2018 British Columbia Building Code and effective for all new construction on December 12, 2018). These are published in the new SBS membrane Standards (Securing the Roof Assembly). System-specific versions of these standards will be adopted over the next few months. In the meantime, the link on the Main Page of the RPM redirects readers to this link in the Guarantee Standards. A similar redirect is now included for other active membrane roof systems (see 3 SECURING the ROOF ASSEMBLY for EPDM, TPO and PVC). A complete revision of the RoofStar Guarantee Standards for ASM Roof Assemblies is now available in the Roofing Practices Manual. This revision represents both a structural and content revision of the section. Fourteen (14) sections have been reorganized, and the content has been both modified and supplemented with new material. A printable version is available for download under the Editor’s Note on the new page. As this will be revised from time to time, the reader is advised to consult the online RPM for the most current wordings. A link to the retired wordings is available for reference (for one calendar year, for projects bid before December 1, 2018), and a PDF of the current Standards is also available for download, for use where digital connectivity is limited. A complete revision of the RoofStar Guarantee Standards for SBS-modified Bitumen Membrane Roof Assemblies is now available in the Roofing Practices Manual. This revision represents both a structural and content revision of the section. Fourteen (14) sections have been reorganized, and the content has been both modified and substantially supplemented with new material. Please note that changes have been made to Material Discontinuance, Substitutions or Additions in the Material Criteria and Application for Acceptance section of the Roofing Practices Manual. .2 When heat-sensitive insulations are used in a roof assembly, they must be covered with a heat-resistant insulation at least 50 mm (2″) thick. Roof Separation Joints (Expansion and Control Joints, etc.) / Equipment Sleepers / Safety Anchor Piers (poured in place pads) that are completely sealed (enveloped) with membrane flashing (stripping) may be less than 200 mm (8″) in height but must not be less than 100 mm (4″) in height above the finished roof surface. Bonded with the primary membrane in a manner acceptable to the manufacturers of both the expansion joint and the membrane to which it will be bonded. InterWrap Inc. has been purchased by Owens Corning Canada LP. Accordingly, all materials listed under the InterWrap Inc. label are now found on the Owens Corning Canada page of the Accepted Materials in the Roofing Practices Manual. †† NOTE: All conventional roof systems with an overburden (see 10.1.1 & 10.1.2) require a ½” cover board over the top layer of insulation, regardless of its type. Adhere cover board only if top insulation layer is bitumen-coated. .1 Acceptable eave protection consists of one continuous width of accepted self-adhesive rubberized asphalt sheet. Apply on the roof deck, extending from the edge of the roof a minimum distance of 915 mm (3′) up the roof slope to a line not less than 300 mm (12″) inside the inner face of the exterior wall. In high snow regions, extend the eave protection not less than 600 mm (24”) inside the inner face of the exterior wall. Eaves protection membrane is to be carried up all abutments (walls, skylights, etc.) a minimum of 125mm (5″). where the roof overhang exceeds 915 mm (3′) measured along the roof slope from the edge of the roof to the inner face of the exterior wall. Because synthetic and fully-adhered membranes vary in vapour permeability, consult the manufacturer’s specifications and ventilation requirements of the British Columbia Building Code (latest edition). For materials acceptable under the RoofStar Guarantee Program, see Eave Protection & Underlayment. Apply underlayment to all roof decks in shingle fashion, fastened in accordance with the manufacturer’s published instructions and acceptable fasteners. Horizontal runs of underlayment must be positively lapped at least 50 mm (2″) and end laps (vertical joints) must be at least 150 mm (6″). Where negative (backward) laps are unavoidable, only a RoofStar-accepted self-adhering underlayment may be used. Negative laps must be at least 150 mm (6”), and seams must be roller-pressed and sealed with a compatible mastic along the seam edge. Underlayment is to be carried up all abutments (walls, skylights, etc.) a minimum of 125mm (5″). Felt underlays and asphalt shingles must be applied on the same day. To prevent wrinkling, let felt relax before installing. NOTE: See more information on Vapour Retarders in Section B: Essential Elements. .1 Air and vapour barrier performance is not part of the RoofStar Guarantee, and air/vapour barrier materials are not listed in the Accepted Materials section of this Manual. Therefore, the decision to specify an air and/or vapour barrier, the placement of a continuous air and/or vapour barrier in relation to a roof assembly and system, and the selection of suitable materials for that application, is the sole responsibility of the design authority. The design authority is urged to review and consider the performance characteristics of materials available for such applications. Must be sealed to the wall air/vapour barrier on roof replacement projects. .1 Fully supported air and/or vapour barriers must possess a minimum published static puncture resistance rating of 150 N (34 lbf) (ref. CGSB-37.56-M for both test method and standard limits) and be either self-adhering or torch-applied. For unsupported air and/or vapour barriers, see 6.2.3 below. Therefore, while responsibility for the selection of a suitable air/vapour barrier rests with the design authority, a roof designed and built to qualify for a RoofStar Guarantee shall not include either polyethylene sheet plastic or bitumen-impregnated kraft paper. .2 Where air and/or vapour barriers are specified by the design authority, they must be selected from the materials listed in the wind-tested assemblies reports for MARS, PARS or AARS roof systems (excluding polyethylene sheet plastic and kraft paper, as noted above). For a complete listing of current wind test reports, click on the linked system acronyms above. .3 Notwithstanding any of the foregoing, the RoofStar Guarantee Program strongly recommends that any air and/or vapour barrier system be installed over a smooth, continuous plane (for example, concrete or plywood). Consequently, a deck overlay board installed on corrugated steel roof decks in highly recommended. 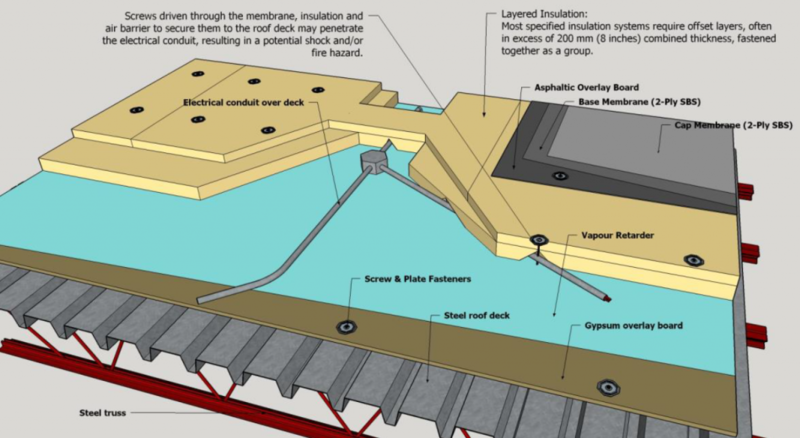 Where no deck overlay board is installed and the air and/or vapour barrier is partially unsupported (for example, on a steel deck), the air and/or vapour barrier must have a published static puncture resistance of at least 400 N (90 lbf). Furthermore, both the side laps and end laps must be fully supported. .4 Should the air/vapour barrier membrane be used as a temporary roof during project construction by either the roofing contractor or by other trades, a minimum 2mm thick bituminous membrane is recommended. .5 Because curing concrete releases considerable moisture that can compromise the performance of a roof system, a vapour barrier installed on new concrete decks (28 days or older) must be selected to prevent condensation inside the roof system. A membrane with a permeability of 0.01 perms (Class I) is recommended. Nevertheless, the selection of the vapour barrier product is the responsibility of the design authority. Roof systems for facilities such as these, with high-humidity environments, may be susceptible to the accumulation of moisture within the roof assembly unless an effective vapour barrier is omitted. Comprehensive changes to the ASM Guarantee Standards have been approved and are forthcoming, subject to the completion of new detail drawings. A separate Technical Update will be issued once the new section material is ready for publishing. Nielson Roofing & Sheet Metal Ltd.
For reference only – see Protected and Modified Protected Roof Systems in B. Essential Elements, and in each of the low slope membrane roof system sections. Heat Sensitive Insulation: On all heat sensitive insulation (polystyrene – both extruded and expanded), an overlay consisting of two layers of acceptable cover board (each with min. 3/16″ thickness) is to be used when using hot-applied adhesive, when torch-welding or where the cover board is less than 1/2″ in thickness on torch applied assemblies. Overlay board thickness shall not exceed 50 mm (2”). Fibreboard shall not be used with flame-welded membrane seams. When the base sheet and cap sheet membrane assemblies are self-adhered or applied using a cold adhesive, the cap sheet membrane must be installed on a clean, dry base. Therefore, barring extreme circumstances, and to comply with the manufacturer’s requirements, the base and cap sheets must be installed and completed together on the same work day. This standard does not apply where torch-applied cap membranes will be bonded to a self-adhering base membrane. Specifications and manufacturers’ written application instructions must be strictly followed. Phased installation of membranes is not permitted. NOTE to Reader: What follows is a substantial change to the RoofStar Guarantee Standards for Waterproofing. Most of the material shown here is new (hence the red text). Note that the section title has changed. SBS Modified Bituminous membranes used on Landscaped and Vegetated conventionally insulated roofing systems with an overburden 200 mm (8”) or less in depth shall consist of two plies and the top ply (cap) must be a minimum thickness of 3.7 mm on the selvedge edge, with a minimum 180g / meters squared polyester or equal strength combination reinforcement. Thermoset and Thermo Plastic (EPDM, TPO, PVC) single ply membranes used for Landscaped and Vegetated roofing systems shall be fully adhered and a minimum thickness of 1.5mm (0.060″). For roof membrane systems insulated above the membrane (Protected Membrane Roof assemblies), refer to the membrane standards under Protected and Modified Protected Membranes and additional requirements set out below in 10.1.2. For further requirements concerning leak detection for Rooftop Gardens, Vegetated Roof Assemblies and Planters, see 10.7 Membrane Moisture Surveys and Electric Leak Detection. Where Extensive Vegetated Roof Assemblies are installed as part of the roofing specification and / or contract, the costs for removal and replacement of soil to access the membrane, to investigate or repair leaks in the membrane, are included in the RoofStar Guarantee coverage. However, the removal and replacement of plants, irrigation lines and or equipment, electrical lines, landscape and decorative features such as concrete pads, statues, planters, large rocks, etc., to investigate or repair leaks in the membrane, is not included, and is the responsibility of others. Consequently, such access shall be provided and/or paid for by others. When an Intensive Vegetated Roof Assemblies with growing medium greater than 150 mm (6”) forms part of the roofing specification and/or contract, the roof must be designed and constructed to the RoofStar Guarantee Standards for a Protected Membrane Roof assembly (see 10.1.2 above). Consequently, the removal and replacement of such overburden is the responsibility of the others, and such costs do not form part of the coverage under a RoofStar Guarantee. 10.7 Membrane Moisture Surveys and Electric Leak Detection. A Membrane Moisture Survey and permanently installed electric leak detection system is mandatory for all roofs that must be designed and installed to meet the requirements for a RoofStar Guaranteed Protected Membrane Roof assembly. Flood Testing is not a recommended practice but is at the discretion of the design authority or owner. If flood testing is required to water test waterproofing membranes, testing shall be conducted prior to installation of insulation and overburdens and be performed to ASTM D5957 – 98. Membrane moisture survey scans must be performed on all waterproofing membrane systems by an independent Moisture Detection Company that is specifically accepted by the RoofStar Guarantee Program. Only electric leak detection systems (utilizing high or low voltage) accepted for use in the RoofStar Guarantee Program may be installed and monitored on waterproofing systems accepted by the RoofStar Guarantee Program. NOTE to Reader: What follows is a substantial change to the RoofStar Guarantee Standards for Waterproofing Plazas, Promenades and Terraces. Only new material is shown in red text; all else has been reorganized, rendering the format completely new. In this Manual, a “wearing course” or “overburden” is used to denote any manner of material, equipment or installation that is situated on top of, and covering all or a portion of, a waterproofing membrane assembly. Wearing courses or overburdens for plaza deck waterproofing systems are classified either as accessible or inaccessible. Waterproofing Systems for pedestrian and emergency vehicle traffic on plaza decks are often designed with inaccessible wearing courses or overburdens. In contrast, Protected Membrane Roofing Systems on plaza/terrace decks are almost always designed with accessible wearing courses for pedestrian traffic and utilize pavers on pedestals. Accessible wearing courses and overburdens are reasonably easy to remove for access to the membrane. Inaccessible wearing courses or overburdens require demolition or substantial material removal to gain access to the membrane, and are often constructed with cast-in-place concrete protection slabs (split-slab) or brick, tile or stone set in mortar beds. Inaccessible Overburdens may also include soils (and associated plants), vegetative assemblies in a growing medium greater in depth than 150 mm (6”), and water features or equipment installations (non-structural but not easily moved). As a result of the potentially high cost of demolition to access membranes under Inaccessible wearing courses or overburdens, the performance criteria for these waterproofing systems are higher. To qualify for coverage under the RoofStar Guarantee Program, an electric membrane leak detection system is required in order to identify and locate membrane breaches that may occur during the waterproofing system’s service life. The RoofStar Guarantee Program strongly recommends the use of wearing surfaces that permit relatively easy access to the membrane. Waterproofing systems that incorporate in the design either Accessible Wearing Courses of a more complex nature, or Inaccessible Wearing Courses, such as poured-in-place concrete, asphalt paving and wearing surfaces units set in mortar beds, etc. must meet additional standard requirements for coverage under the RoofStar Guarantee Program. An Accessible Wearing Course is limited to a maximum of 200 mm (8”) in depth. Accessible Wearing Courses can be comprised of various materials, subject to some limitations. Concrete pavers on pedestals permit easy access to waterproofing membranes and therefore are the best choice (whenever practicable) for an Accessible Wearing Course over all waterproofing systems. When pavers are used as the walkway material, they must be spaced no closer than 3mm (1/8″) and must be supported by non-abrasive pads or proprietary pedestals providing a minimum of 12.5 mm (1/2″) of vertical separation layer for airflow and levelling. The choice of pedestal or drainage layer type is the responsibility of the design authority. Pedestals provide airflow for drying surfaces and assist in leveling. They should not impede the flow of water or air, and should uniformly distribute the dead load of pavers and predicted live loads. An Accessible Wearing Course may include installed unit masonry, brick, tile or stone (placed on sand and or gravel beds), and both Extensive and Intensive Vegetated Assemblies. That said, some of these types of wearing courses are more difficult to remove than pavers on pedestals. Consequently, an installed electric leak detection system may be mandatory. For further information and the RoofStar Guarantee Standards applicable to leak detection systems, see 13.3.2 below. In the event the waterproof membrane requires repairs or maintenance, Accessible Wearing Courses will be removed and reinstalled under the terms and conditions of the RoofStar Guarantee. Replacement of any components that cannot be reinstalled, due to breakage or other factors, remains the responsibility of the Owner. Wearing Courses greater than 200 mm (8”) in depth, regardless of their composition, are considered Inaccessible. Typically, an Inaccessible Wearing Course is one designed for pedestrian and emergency vehicle traffic on plaza decks, and includes cast-in place concrete protection slabs (split-slab) and brick, tile or stone set in mortar beds. Because Inaccessible Wearing Course designs require demolition for access to the membrane, an installed electric leak detection system is mandatory. Electric leak detection systems that are specifically accepted by the RoofStar Guarantee Program are listed in the Accepted Materials: Leak Detection & Monitoring Systems section of this Manual. Solid cast-in place concrete protection slab (split-slab) and asphalt paving wearing courses shall incorporate surface score lines (indents) to facilitate cutting for removal of wearing course sections in order to locate possible breaches in membranes. Score lines shall be straight edged grid patterns (squares, rectangles, diamonds, etc.) with indents spaced at a maximum of two (2) metres apart. Because of their nature, the removal and reinstallation or replacement of Inaccessible Wearing Courses is not covered under the terms and conditions of a RoofStar Guarantee. A membrane moisture survey (see 13.3.1) is required for all waterproofing membrane systems, prior to the installation of any overburden or wearing course. When mandated in this Manual, an electric leak detection system (13.3.2) shall be installed on the waterproofing membrane, or placed over protection boards or SBS membranes that have been set in hot fluid-applied modified asphalt, prior to the application of overburdens or wearing courses. The leak detection system may be constantly monitored, but ongoing monitoring is not a requirement of the RoofStar Guarantee Program. water features or equipment installations (non-structural but not easily moved). An installed electric leak detection system is also mandatory on all waterproofing systems covered with Inaccessible Wearing Courses. Where the electric leak detection system of choice utilizes a sensor ribbon installed on the waterproofing membrane in a grid pattern, the ribbon spacing shall be no less than three (3) metres in any direction for waterproofing systems covered by an Accessible Wearing Course, and no less than two (2) metres in any direction for waterproofing systems covered by an Inaccessible Wearing Course. Roof drains and other roof accessories are to be installed as per membrane manufacturer’s instructions. When cast-iron roof drains…. proprietary secondary stainless steel debris strainers is acceptable. All scupper drains shall be formed with a minimum 37.7 mm (1 ½”) lower outside faces than side walls of the water collection boxes and incorporate minimum 12.7 mm (½”) drip edges on the lowered outside faces. An overflow is only a secondary drain that serves as a safeguard when primary drains fail. Overflows must incorporate a continuous flange surrounding the drain box, measuring at least 100 mm (4”) in width, and may be manufactured from ferrous metals, subject to the Material Selection [hyperlink] standards for metal found in this Manual. .1 Unroll membrane and draw tight to minimize wrinkles and folds; lap adjacent sheets (50) mm (2″) to fabricate hand-welded seams, and lap adjacent sheets (100) mm (4″) to fabricate 38mm (1.5″) machine-welded seams. .2 Heat-weld seams according to Membrane manufacturers’ printed instructions. .3 Place proprietary fastening bars over membrane and fasten through pre-drilled holes; bar and fastener placement to be determined by membrane manufacturer. .4 Weld a membrane cover strip over each bar. .5 Install continuous fastening bar at the base of perimeter and vertical flashings. .6 Complete perimeter flashing details according to membrane manufacturer’s details and specifications. A Roof System (different from a roof assembly) excludes the structural roof deck but includes the roof covering and any other components, including insulation. roofs above 60’ refer to Section 3.8.5. Note: Refer to part 4 of the applicable code to ensure compliance. keeping with the requirements set out below. (see exceptions noted below). Click here for a list of qualified testing facilities. (latest edition), Div. A, Part 1, Section 1.1 General (cf. 1.1.1.1. Application of this Code, and 1.1.1.2.
be selected from the Accepted Materials section of this Manual. In the past, roofing was installed over wood decks using mechanical fasteners. As construction technology progressed, many new types of decks developed bringing with them different securement requirements. Concrete and other non-nailable decks dictated that an adhesive, usually bitumen, be used to apply the roof insulation and roofing. On sloped roofs where securement is required to prevent slippage, wood nailing strips must be cast into or fixed to the deck to permit mechanical attachment. On steel decks, the initial use of bitumen as the adhesive has proven to be less successful than adhesion to concrete. Steel deck deflection can result in breaking the adhesive bond between the insulation and the deck. In addition, the use of bitumen may contribute to the fire hazards associated with steel decks. for the dynamic wind uplift resistance of membrane roofing systems. .1 Metal roofing systems must be installed with clips and screws that are specified or listed as acceptable, by the metal panel machine manufacturer, for use with the metal roofing system. .2 Contractors and owners of metal panel machines are responsible to meet or exceed the panel machine maintenance standards as established by the roll form machine manufacturer. .4 Sheet steel roof panels may be roll-formed to a maximum of 500 mm (20”). these may be roll-formed with or without stiffening ribs or striations incorporated into the panels. substrate a minimum of 19 mm (3/4”). job site condition, only appropriate screw-type fasteners with neoprene washers may be used. Only in-seam S-lock and standing seam clip fasteners are exempt from this requirement. following length. See RGC Guarantee Standard A6.8 for requirements. for guarantee requirements, Guiding Principles and Recommendations in any application. coasted on top with small rock (these are commonly referred to as ‘tar and gravel roofs’). roof covering and any other components, including insulation. Guiding Principles and Recommendations in any application. fashion, shed water from a roof. that have been tested to and conform with the CSA A123.21-14 Dynamic Wind Uplift Standard. These lists and Roof System Assessment Reports will be reviewed by the Technical Committee at the fall 2016 meeting. Please note that the Roofing Practices Manual (RPM) now requires that mechanically fastened membrane systems conform to the CSA A123.21-14 Dynamic Wind Uplift Standard (2.1.1, A4.4). Further amendments to the RPM are forthcoming, and will require conformity with the CSA A123.21-14 Dynamic Wind Uplift Standard for all tested systems (MARS, AARS and PARS), for projects bid after either April 1, 2017 or the release of the 2017 British Columbia Building Code, whichever comes first. The CSA A123.21-14 test method applies only to membrane roofing systems whose components resistance to wind uplift is achieved by fasteners or adhesives. The current National Building Code of Canada recognizes the CSA A123.21-14 as the only method to determine compliance of a roof assembly for wind uplift. It is anticipated the BC Building Code will adopt this test method with the 2017 release. The RCABC Roofing Practices Manual (RPM) will be listing the approved materials/assemblies after review by the Technical Committee at their meetings currently scheduled for September 2016 and January 2017. Please refer to the sections noted above in the 2015 National Building Code for the entire provision parameters. Despite item 1 above, and regardless of each product’s past performance, RCABC will require conventional low slope roof membrane systems to meet the CSA A123.21-14 standard. Red bold italics in this bulletin indicate changes made to the RoofStar Guarantee Standards wording. Refer to the published RoofStar Guarantee Program Standards. No PV or solar water panels may be mounted on shingled roofs having a pitch of less than 4:12. All PV or solar water panels designated for installation on a roof carrying a RoofStar Guarantee must display an authentic decal or plate indicating compliance with CSA Standard B272-93. Shingle underlayment requirements for STR-LS Asphalt Shingles shall apply to roof areas where PV or solar water panels are installed. All PV or solar water panels shall be mounted at least 150 mm (6 inches) from the finished roof surface (shingles). (Low Slope) .1 Strip-in type roof penetration flashings (lead, aluminum, stainless steel, copper, etc.) must be properly sized to fit pipe penetrations or alternatively, when pipes are irregular in size spray foam urethane insulation may be used to fill gaps between pipes and flashings. Strip-in type roof penetration flashings are only permitted for use with single pipe roof penetrations, must incorporate properly fitted settlement caps, and be a minimum height of 200 mm (8″) above finished roof surfaces. Pipes that are higher than standard flashings must have site formed non-bituminous flexible roof membrane storm collars sealed with compatible sealants and stainless steel clamps. Where shrink-wrapped terminations are employed, they shall be fitted with a stainless steel mechanical compression strap, and sealant shall be applied between shrink-wrap and penetration. Perimeter fastening along the entire eave will be enhanced to corner requirements. The corner area is defined by the perimeter in both directions at the corners. In no case will the corner area be less than 2.0 m x 2.0 m (7’ x7’). For corner enhancement of roofs in high wind locations (higher than 100 mph) or for roofs above 60’ refer to Section 3.8.5. NOTE: To qualify for a RoofStar Guarantee, and to comply with the Guarantee Standards in 4.6 (below), mechanically attached membrane systems for projects bid after either April 1, 2017 or the issuance of the British Columbia Building Code, 2017 Edition (whichever comes first) must be fastened according to each manufacturer’s tested specifications complying with conforming to CSA A123.21-14 or a FM 1-90 Standard for assembly wind ratings. .10 All vegetative roof systems using a modular system are required to meet CSA A123.24 “Standard test method for wind resistance of modular vegetated roof assembly”. .1 When a built in membrane gutter joins an RGC Guaranteed sloped roof; the gutter will be included by the Guarantee. Built-in membrane gutters that drain a roof not covered by an RGC Guarantee are not eligible for a Guarantee. .2 Membranes installed as a gutter liner must be fully adhered and mechanically fastened at terminations. The accepted flexible membrane roofing system must be installed to RGC Guarantee Standards and the manufacturer’s printed instructions. .3 Built in gutter membranes must extend up the roof slope to a point, which is 150 mm (6″) vertically above the maximum water level of the gutter or outside parapet height (see Section 7.5) “Built in Gutters for Water Shedding Roofing”). .4 Fasteners shall be installed 4” or more above the maximum water line, and gutters must include a scupper overflow drain. All metal roof systems require the installation of an RGC accepted underlay. .1 For insulated metal roof systems…..
.10 Built in gutter membrane over insulation must transition onto underlayment membrane that is under insulation by use of sloped insulation and as detailed in construction drawing, Section 8.3 Built in Gutter Membrane / Underlayment Transition for Insulated Metal Roof Systems. .11 Minimum allowable thicknesses for a modified bituminous membrane underlayment is 1mm. .4 All membrane flashing (stripping) terminating on a vertical surface must be mechanically fastened. Fasteners shall be installed to suit/match vertical structural supports but shall be placed no more than 24” o/c. Where a new roof is tied-in to an existing roof, the two areas must be isolated and separated by a curb joint properly constructed a minimum height of 125 mm (5”), attached to the structure and properly flashed. If job conditions or aesthetic considerations do not allow for a curb joint, written permission from RGC to eliminate curb joints must be obtained and a positive water cut-off must be installed to the deck to isolate the existing roof from the new roof. Where a new roof is tied-in to an existing roof, the two areas must be isolated and separated by a curb joint properly constructed a minimum height of 125 mm (5”), attached to the structure and properly flashed. Proprietary (purpose-made) pedestals must have a 3mm (1/8”) integral spacer ribs for uniform spacing between pavers that provide a minimum 12.5 mm (1/2″) of vertical separation layer for airflow and leveling. The choice of pedestal or drainage layer type is the responsibility of the design authority. Pedestals / drainage layers provide airflow for drying surfaces and assist in leveling. They should not impede the flow of water or air, and should uniformly distribute the dead load of pavers, and other unit masonry products, as well as predicted live loads. A design authority or membrane manufacturer may specify a proprietary walkway protection system or warning zone membrane over the primary roof membrane. Walkway and warning zone materials are not part of the roofing membrane assembly but are typically accessory products that are placed over completed roof membranes. Subsequently the type and performance of any walkway or warning zone material is specifically excluded from coverage under the RGC guarantee, as is any detrimental effect the materials may have on the roof system. Where walkways are employed, they must be designed to facilitate drainage of water. To promote drainage, use accepted concrete-topped XPS insulation panels, or pavers located on purpose-made pedestals. When pavers are used as the walkway material, they must be spaced no closer than 3mm (1/8″) and must be supported by non-abrasive pads or proprietary pedestals providing a minimum of 12.5 mm (1/2″) of vertical separation layer for airflow and levelling. The choice of pedestal or drainage layer type is the responsibility of the design authority. Pedestals provide airflow for drying surfaces and assist in leveling. They should not impede the flow of water or air, and should uniformly distribute the dead load of pavers and predicted live loads. .1 Membrane flashing (stripping) details (with the exception of low parapets, cant strip edges and RGC accepted door sill details) must be designed to provide a minimum 200 mm (8″) sealed height above the finished roof surfacing. Surfacing is defined as the top of the roofing assembly, be it membrane, ballast or growing medium (soil). .2 Roof Separation Joints (Expansion and Control Joints, etc.) / Equipment Sleepers / Safety Anchor Piers (poured in place pads) that are completely sealed (enveloped) with membrane flashing (stripping) may be less than 200 mm (8″) in height but must not be less than 100 mm (4″) in height above the finished roof surface. A metal water stop flashing, formed with pan folded, welded or soldered corners must be mechanically attached to inside of doorsill framing or opening and be sealed with membrane flashing (stripping). Membrane flashing, (stripping) or metal pan sill flashing must be installed at doorjamb framing or opening to a minimum height of 100 mm (4″) above doorsill framing or opening, prior to installation of doorjambs and doorsills. *Membrane gussets must be installed at sill corners. Metal pan sill flashings or RGC accepted reinforced liquid flashing systems must be installed wherever clearances preclude the use of membrane flashing (stripping) to seal door sill details. Overflow drains in that area must be installed a minimum 25 mm (1″) lower in height than adjacent door sills. When design or safety codes require minimal elevation changes between a low door sill and an outdoor walking surface (ref. BC Building Code), the walking surface must be pavers placed on proprietary pedestals designed with a least 12.5 mm (1/2″) clearance between the finished roof surface and the paver. Alternatively, pea gravel may be used in place of pedestals, but must be installed above a dimple-style drainage board. .6 Where Extensive Vegetative Roof Assemblies are installed as part of the roofing specification and / or contract (Extensive Vegetative Roof Assemblies are defined as roof top gardens having minimal plant species diversity, irrigated only to establish plants, and typically having a soil depth of less than 150 mm or 6 inches) the costs for removal and replacement of soil to access the membrane, to investigate or repair leaks in the membrane, are included in the RGC Guarantee coverage. However, the removal and replacement of plants, irrigation lines and or equipment, electrical lines, landscape and decorative features such as concrete pads, statues, planters, large rocks, etc., to investigate or repair leaks in the membrane, is not included, and is the responsibility of others. Subsequently, such access shall be provided and/or paid for by others. .7 Where Intensive Vegetative Roof Assemblies are installed as part of the roofing specification and/or contract (Intensive Vegetative Roof Assemblies are defined as roof top gardens with diverse plant species, irrigated for maintenance and typically having a soil depth equal to or more than 150 mm or 6 inches), and where the soil thickness of Intensive Vegetative Roof Assemblies exceeds 200 mm (8″), the removal and replacement of soil and plants to access the membrane to investigate or repair leaks in the membrane is the responsibility of others, and such access shall be paid by others. In addition, the removal and replacement of plants, irrigation lines or equipment, electrical lines, landscape and decorative features such as concrete pads, statues, planters, large rocks, etc., to investigate or repair leaks in the membrane is also the responsibility of others, and such access shall be provided and/or paid for by others. .9 Waterproofing liners in planters with structural walls, concrete curb or other materials, that do not incorporate pre-curbs shall be isolated and separated from the guaranteed roofing membrane and are specifically not accepted under the RGC guarantee. Conventionally insulated roof assemblies are required to have a minimum 12.5mm (1/2″) adhered approved RGC accepted gypsum overlay board, and insulation boards with a minimum compressive strength of 20 psi, under the roof membrane for extensive vegetated systems. Intensive Vegetative Roof Assemblies in excess of 200 mm (8″) or more in depth are not permitted over conventionally insulated roof systems. FT Synthetics Platinum, FT Synthetics Gold and FT Synthetics Silver accepted asphalt shingle and metal roof underlayment for slopes 4/12 and greater. .1 Gypsum Board on Steel Decks Gypsum boards installed over steel decks as substrates for primary roof membranes must be a minimum thickness of 12.7 mm (1/2″) RGC accepted overlay boards. All edges of the gypsum board are to be fully or intermittently supported by the deck and end joints to be staggered (offset) 300 mm (12″) from adjacent board rows. A minus offset tolerance of 50 mm (2″) maximum will be permitted to compensate for variance in the manufacturers’ tolerance of differing board widths and lengths. .2 Gypsum Board Attachment on Steel Decks When gypsum board is required on steel decks as a substrate overlay, the gypsum board can be fully mechanically fastened to the deck or adhered with proprietary polyurethane foam adhesives acceptable to the primary roof system manufacturer. Attachment must meet or exceed the CSA A123.21-14 requirements for the building dimensions and geographical location. .1 When installing insulation or thermal barriers to steel decks, all edges of the first layer of insulation or thermal barrier shall be fully or intermittently supported by the deck when the total thickness of insulation is less than 2.7″. .2 Mechanical fasteners must penetrate steel decks a minimum of 20mm (3/4″) and must be located in the top flutes only. Adhesive systems must be tested to meet or exceed the CSA A123.21-14 requirements and designed for the building dimensions and geographical location. The following safety bulletin was received from the BC Safety Authority regarding the protection of electrical raceways and cables under roof systems and decks. This is already a requirement under the RoofStar Guarantee Program, as it is a safety concern for the roofing installers and a fire risk to the building, but has now been brought to the attention of electrical inspectors and designers. The following bulletin provides guidance on the application BC Electrical Code: Sections 2 & 12. The Roofing Contractors Association of British Columbia (RCABC) has reported a recent increase in occurrences of electrical raceways and cables being installed within, or adjacent to the underside of, roof systems or roof decks. Cables and raceways, installed in proximity to roof systems or roof decks may be subject to mechanical damage during roof installation or repairs. Nails and screws, used to penetrate the roofing from the top during the roof installation process, could easily penetrate electrical cables and raceways installed within or adjacent to roof systems or roof deck. This could result in electrical shock or fire hazards. 1. Rule 2-032 Damage and Interference requires that no person shall cause damage to an electrical installation or components thereof, except when it is necessary to disconnect or move components of an electrical installation during alterations or repairs; it is the responsibility of the person carrying out the alterations or repairs to ensure the electrical installation is restored to a safe operating condition. Persons performing roof installation, alteration, or repair must ensure that they have identified and located all electrical equipment installed within or adjacent to the roof system or roof deck before carrying out their work. Mapping out of conduit and cable locations, disconnection of electrical power within work areas, and safe work practices will reduce or prevent electrical fire and shock hazards. Electrical contractors should ensure that electrical drawings accurately show locations of electrical raceways and conduits upon completion of their work. Alteration or relocation of electrical conduits, raceways, and equipment may only be performed under a valid electrical permit. 2. Rule 2- 200 General requires that electrical equipment must be protected and guarded against mechanical damage or other damage to which it is liable to be exposed. b) the electrical equipment is protected from mechanical injury by a steel plate not less than 5mm (3/16 inch) thick extends at least 38mm (1-1/2 inches) beyond the electrical equipment on each side. See updates to Accepted Materials, highlighted in Sections 2.2, 3.6, 3.7, and 5.1. .1 Multi Layering: All square edge flat format insulation boards greater than 67.5mm (2.7”) in thickness shall be installed in multiple layers. With the exception of systems that include tapered insulation, individual layers are not to exceed 60% of total insulation/overlay board assembly. Multi layering of plastic foam insulation is required for all adhered, mechanically attached, and ballasted low slope roof assemblies. In addition, all slope format plastic foam insulation boards greater than 150mm (6”) in thickness shall be installed in multiple staggered layersor alternatively, be installed under two (2)offset/staggered layers of RGC accepted insulation overlay boards. .2 Overlay Boards: RGC accepted insulation overlay boards shall be installed over all insulations (EPS, XEPS, Polyisocyanurate) on all adhered low slope roofing systems. When heat sensitive insulations (EPS,XEPS) are used with heat welded membrane seams an accepted overlay board must be installed. Overlay board thickness shall not exceed 50mm (2″). Fibreboard shall not be used with flame-welded seams. .3 Insulation and overlay board joints are to be offset/staggered 300 mm (12″) from adjacent layers and rows. A minus offset tolerance of 50 mm (2″) maximum will be permitted to compensate for variance in manufactured tolerance of differing insulation board widths and lengths. The exception is sloped insulation boards that are generally installed soldiered fashion to adjacent rows; and the first layer of overlay board over heat sensitive insulation to facilitate joint taping. However, the uppermost layer of insulation or overlay board directly below membranes shall have joints that are offset/staggered from adjacent layers and rows. .9 Waterproofing liners in planters with structural walls, concrete curb or other materials, that do not incorporate pre-curbs shall be isolated and separated from the guaranteed roofing membrane and are specifically not accepted under the RGC guarantee. Conventionally insulated roof assemblies are required to have a minimum 12.5mm (1/2″) adhered approved RGC accepted gypsum overlay board, and insulation boards with a minimum compressive strength of 20 psi, under the roof membrane for extensive vegetated systems (less than 200 mm, 8″ in depth). Intensive vegetated systems (200 mm, 8″ or more in depth) are not permitted over conventionally insulated roof systems. Guarantee standard A2.3 regarding conduit within a low slope roof system first appeared in the Roofing practices Manual in the 1980’s. It restricted the installation of conduit on top of the roof deck unless express written permission was removed and further definition regarding EMT and cabling was added. Aside from the immediate problems of reduced insulation thickness over the conduit and air barrier continuity, fasteners used for insulation boards and/or inseam membrane attachment easily penetrate the conduit causing electrical and possible fire danger. Electrical codes in other building jurisdictions were modified in 2011 to reflect this, referencing the possible conductor damage during initial roof installation and future re-roofing. #30 asphalt saturated felt and nail applied proprietary synthetics be removed from STR-AS as an eave protection membrane. “Plastic foam” to be deleted from A4.1 in order to include mineral wool insulation boards in multi-layering. The point of installation is extended to 24″ past the inside face of the wall in high snow load areas as per 3.5 KPA noting that individual requirements may dictate additional eaves protection. Alpha Roofing & Sheet Metal Inc.
Revised to include an extra step in the method description for alternative reverse lap application of a self adhered SBS modified bitumen base sheet membrane followed by a torch applied field membrane. Metal panel rollforming machines that produce a currently accepted panel, acquired by active member companies, can be accepted in the RoofStar guarantee program by the technical manager. Marine Roofing & Sheet Metal Ltd. Effective January 2014, requirements for testing and conformance of wind uplift pressure have changed with respect to proprietary mechanically attached or adhesive roof assemblies. Wording be added to A1.1 referring the reader to Tab 3.1.3 where further explanation can be made regarding Factory Mutual FM 1-90 assemblies. There have been reports of moisture accumulation within bundles between the fibreglass faced polyisocyanurate insulation boards on various jobsites throughout BC. The problem has been sporadic; occurring or not occurring under what appears to be similar circumstances. At this time there is no conclusive evidence of the moisture source but the wet material has been rejected for use, causing production delays and related costs of replacement to all parties involved. Prestige Snap-Lock Metal Roof System, accepted metal panel roof system. Secureshield HD polyisocyanurate coverboard, accepted insulation overlay board for Carlisle roof systems. Storm Shield Ice & Water Protector, eaves protection for asphalt shingle roof systems. Depiction of plastic cement applied at metal drip edge flashing will be removed. All proprietary asphalt shingle ridge cap material installed on RoofStar guarantee projects must be made by the same manufacturer as the field shingles. Cascade Roofing & Waterproofing Ltd. When panel clips with bearing plates are installed directly over insulation the compressive strength of the insulation must be a minimum of 138 kPa (20 psi) and the maximum thickness of the insulation shall not exceed as specified in the proprietary designed assembly. Drag load fastening must be designed to withstand the anticipated loading. Insulation bearing plates are not permitted for use in high snow load regions unless expressly accepted in writing under the seal of a structural engineer. A1.5.3 Gypsum boards on vertical surfaces must be RGC Accepted overlay boards with fibreglass facers and silicone treated cores. On steel framed walls, fibreglass faced silicone treated gypsum boards with a minimum thickness of 12mm (1/2”) or fibre-mat reinforced cement boards with a minimum thickness of9.5mm (3/8”) that conform to ASTM C1325-04 are an acceptable vertical substrate to receive roofing. The installation of roof membrane to the surface must be as per the membrane manufacturer’s requirements for that substrate. A2.3 Conduit, EMT, cable and/or piping applied on the top of roof deck surfaces shall not be acceptable on new construction projects. If conduit is present on decks in re-roofing projects, the deck must be made smooth and even to the satisfaction of the accepted roof inspection firm. The upper layer of insulation must cover the conduit, EMT, cable and/or piping. 1.5 Eave protection – RGC accepted self-adhered, rubberized asphalt sheet material (see tab 3.15) #30 non-perforated asphalt saturated felt, or RGC accepted proprietary underlayments that meet or exceed the requirements for #30 non-perforated asphalt felt, CSA A123.3-05 (2010). A4.1.3 Overlay boards – RGC accepted insulation cover or overlay boards shall be installed over all plastic foam insulations on all adhered low sloped roof assemblies. All insulation types shall have a minimum compressive strength of 110 KPa (20 psi) when installed without a cover board under mechanically attached membranes. A4.1.3 Overlay boards – RGC accepted insulation cover or overlay boards shall be installed over all plastic foam insulations on all adhered and mechanically attached low sloped roof assemblies. SBS Cap sheets and base sheets accepted or use as waterproofing membrane systems. GMX Hot-applied Rubberized Waterproofing Membrane accepted for use as waterproofing systems. SBS Roofing Membranes accepted for use as roofing membranes under RPM Tab 5 in the RGC Guarantee program. And Garland Canada Inc. Fiberglass Felts and SBS Cap Sheets Systems accepted under RPM 4.6 Proprietary BUR. IKO MS DETAIL with reinforcement scrim, accepted for use as a liquid applied membrane flashing. Manufacturer’s proprietary adhesive applied modified bituminous system that utilizes IKO Cold Gold brand adhesive, as tested by NRC for compliance with CSA A123.21-04 Wind Uplift Standard for Adhesive Applied Low Slope Roof Assemblies. Roof Moisture Survey System accepted for use as a moisture survey and monitoring system in the RGC waterproofing program. Underlayment Membranes for cedar shakes and shingles, asphalt shingles, as well as metal roof panels accepted for use in the RGC guarantee program. A1.2 Material Storage & Protection – All installed roofing system materials that are susceptible to moisture damage shall be made weather tight by end of each work day. Asphalt Single specification 7.1.2 Steep & 7.1.4 Low Slope as well as Cedar Shake and Shingle sections in Tab 7.2 now include the following requirement. A6.3 Strip in Type vents and penetration flashing (low slope) – strip-in type roof penetration flashings (lead, aluminium, stainless streel, copper, etc. must be properly sized to fitted roof pipe penetrations or alternatively when pipes are irregular in size oversized flashings with sprayed foam insulation may be used. All organic based asphalt shingles are, as of this date, NOT accepted for use in the RGC guarantee program and all listings for organic based asphalt shingles will be removed from the RGC Accepted Materials list. Vent Heights – RGC guarantee standards are now a minimum of 200mm (8″) on roof slopes of less than 1:3 (4″ in 12″) for all roofing material types. Concrete Cold Joints – the following requirements for concrete cold joins have now been added to the RGC guarantee standards E Waterproofing, E2.2 Concrete Decks, .4 Cold joints between concrete pours, at horizontal concrete decks and vertical walls that are at or below grade, shall be sealed and covered with waterproofing membrane flashing. Membrane flashing shall cover all deck/wall transitions, shall lap over cold joints and onto horizontal slabs (deck) a minimum of 200mm (8″) and be compatible with both the deck and wall waterproofing or damp proofing materials. Or alternatively, when materials at deck/wall transitions are not compatible the use of compatible sealants and termination bars that create a watertight lap that is a minimum width of 200mm (8″) is acceptable. Insulation & Thermal Barriers on Steel Decks – A4.5.1 When installinginsulation or thermal barriers directly over steel decks, all edges of the insulation orthermal barriers are to be fully or intermittently supported by the deck.